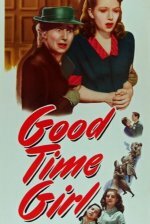 As the reform school rebel who hooks up with a gang of American crooks, Jean Kent created a screen image that she was never totally able to shake in this moody melodrama. It's adapted from the Arthur la Bern novel Night Darkens the Streets, which was itself inspired by a true-life incident. Kent's sneering, sultry performance must have seemed very daring in those dank postwar days, but nowadays her petulance seems more like posturing. Director David MacDonald allows the plot to meander in order to make the most obvious social observations.